Strobl is a village in the Salzkammergut, situated by Lake Wolfgangsee. It is connected to the highly touristy villages of St. Gilgen and St. Wolfgang via boats, which offer popular cruises on the picturesque lake. Strobl is the least famous town on Lake Wolfgangsee. That being said, there is of course a strong tradition in summer holidays in Strobl - it wouldn′t be the Salzkammergut otherwise. Strobl has a population of almost 3,500 - but significantly more people staying during the summer season. Strobl is known as the Wolfgangsee community with the flattest shoreline, which results in relatively high water temperatures and led to particularly nice lidos. The name Strobl means "man with fluffy hair" and is linked to the family of the same name that first founded and then developed a settlement in this area. It became the official name of the community only in the 19th century. At this time, the village centre became a stop for a post carriage, which allowed wealthy aristocrats to conveniently travel to Strobl from the Imperial spa town Bad Ischl. In the late 19th century, leading aristocrats and intellectuals such as Hugo von Hoffmannsthal (he of the Salzburg Festival) spent summers in Strobl. The so-called Gründerzeit ("founder′s age") and fin de siecle, eras of unseen economic development, were the golden age of Strobl. Industrialists such as Baron Gecmen-Waldeck developed summer properties in Strobl and made them hot-spots of social events. Their villa became a hotel after WWII and is still one of Strobl′s most prominent landmarks. Many noble families and industrialists followed the Gecmen-Waldeck′s example and built further villas. A lakeside promenade was built. Today, Strobl is one of the most touristy communities in the Flachgau. It has more than 2,000 beds to offer and sells over 230,000 overnight arrangements per year, almost all of them during the summer season. In terms of sightseeing, Strobl benefits from the good connection to St. Wolfgang and St. Gilgen. In Strobl itself, note the over-all fin de siecle atmosphere, probably the best you get in all of Salzburg except for Bad Gastein. Note also the late Baroque parish church. There is the so-called Deutschvilla in Strobl, which serves as a cultural venue for the community; during the summer, the University of Vienna does courses in European studies in the Deutschvilla. 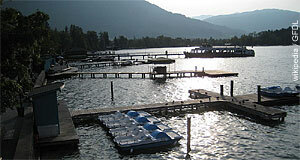 Once a year, there is a festival of literature in Strobl, the so-called "Internationale Literturakademie Salzkammergut". It is supplemented with workshops and typical for semi-leisurely, somewhat mundane summer courses that are popular all over the Salzkammergut. There are also numerous excellent hiking opportunities and the skiing area of Gaißau-Hintersee is not far from Strobl. Needless to say, water sports are popular in Strobl and elsewhere on the Wolfgangsee, too.